The quantitative measurement of kind, positions and diameters of steel reinforce ments in building constructions is a typical inspection problem in civil engineering. A classical solution is the combination of film radiography with the multi angle technique and graphical backprojection. New digital detectors reduce the exposure time and allow the application of stereo radiography and computed laminography as routine applications. The computed laminography allows fast and effectively the determination of the depth of reinforcements in concrete or masonry. A selected area of the steel re-bar structure is penetrated by gamma-rays from different angles of incidence (multi angle-technique) with a Co-60-source. Instead of a radiographic film phosphor imaging plates were used as a new digital medium for filmless radiography. A 3D-image of the measured region of interest is reconstructed from the digitised projections of a test block. The reconstruction is based on special tomosynthesis algorithms which need few projections only. Radiographic techniques were uses in completion to other techniques like radar, electromagnetic alternating field inspection to examine the structure of different buildings. Experiences of inspections of historical buildings, ancient marble structures and a bridge girder are presented where different levels of radiography were applied. The non-destructive determination of the kind, position and geometry of re-bars and other metallic fittings in building elements is important for the evaluation of the load bearing capacity and the usage property within the scope of building condition and damage analysis. In this case different non-destructive testing methods can be applied. Devices, based on the electromagnetic alternating field method, can locate ferromagnetic reinforcement in a maximum depth of approx. 12 cm. The radar method allows to locate the reinforcing steel in a larger depth. However, this method is not suitable to determine the cross section geometry quantitatively. 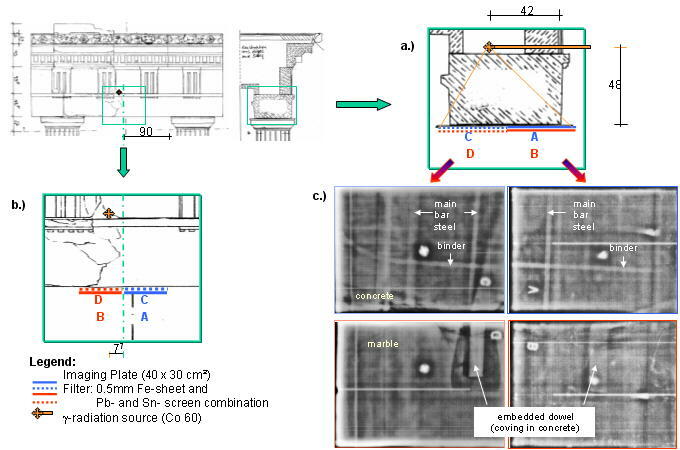 In contrast to this methods an exact determination of cross section geometry and depth position of the reinforcing steel can be realised with the radiography. Thereby, depending on the complexity of the test problem, classical and modern laminographical methods can be applied. Gamma- and X-ray inspection of concrete and masonry structures is a wide spread application. It provides highly resolved transmission images of these structures. The basic goal of inspection is the visualisation of pipes, steel reinforcement bars, fittings or tension cables. The most frequent examinations are performed to find areas for positioning of drillings. Furthermore, there is some need to measure reinforcements for static calculations and in some cases corrosion problems and damages shall be found. Also cracks and voids in the concrete can be visualised, but this belongs to the rare requests. The structure examination is not restricted only to concrete constructions, it can be also applied to reinforced masonry made of natural stones or bricks. The classical inspection arrangement consists of a radiation source at one side of the object to inspect and an X-ray film at the other side. There exist also radiation methods for one-side inspections, using the backscatter effect . These methods need long inspection times and are limited to single layers of reinforcement near the surface. The selection of the source depends on the wall thickness, which shall be inspected. Fig. 1 shows the wall thickness range for the different sources available. Fig 1: Wall thickness range for concrete inspection with different radiation sources corr. to guideline B1 of the German Society for NDT. Typical X-ray films are covered with lead screens for high spatial resolution. These films need about ten times higher exposure times than films with fluorescent screens. The latter ones are usually chosen if no requirements for a spatial resolution better than 0.2 mm exist. Recently phosphor imaging plates are used for concrete inspection (computed radiography or CR). Its sensitivity depends on the thickness of its phosphor layer. With a typical layer thickness of about 0.3 mm (medical plates) they can be used for digital radiography of concrete . The required exposure time is comparable with the fluorescent screen film systems. For better image quality higher exposure time is recommended. Also flat panel detectors based on amorphous silicon photodiode arrays with fluorescence screen are available for high energy applications. Due to its high price and limited working temperature range, mobile applications are very limited. Especially for high wall thickness inspections all detectors provide only sufficient image quality if intermediate filters are used. For film radiography above 40 cm of concrete an intermediate sandwich filter, consisting of 2 mm lead and 2 mm tin or copper or 2 mm steel shall be used. Good experiences were made with lead, tin, copper sandwiches. Copper or steel shall be at the film side. 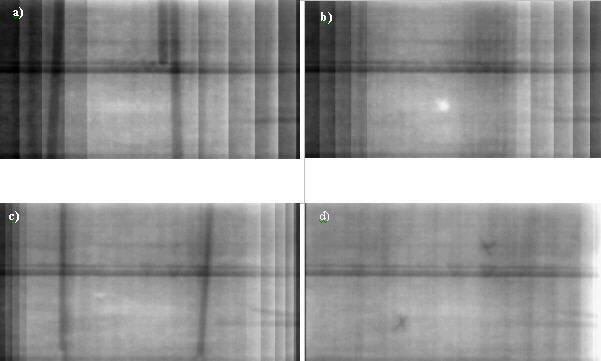 Phosphor imaging plates are more sensitive against scattered radiation than film systems. Therefore, 4 mm lead (instead of 2 mm for film) was used for Co-60-exposures above 50cm concrete for CR. Stereo radiography is used for quantitative measurement of depth and diameters of steel reinforcements. Fig. 2 shows the principle of the procedure. It needs two different source positions. The reconstruction can be done by a graphical back projection or a computerised one. The simple graphical backprojection is sufficient for so called simple structures. This is usually some separated steel parts or one layer of steel bars. Fig 2: Principle of stereo radiography corr. to guideline B1 of the German Society for NDT. For more complicated structures more than two projections are required. This technique is called multi angle radiography. Due to the special geometrical structure of concrete objects, the coplanar translational laminography (fig. 3) can be applied in most cases. This principle requires the parallel and synchronous shift of detector and radiation source above and below the object to inspect. It is sensitive for small structures, which are oriented perpendicular to the direction of movement. Due to the development of digital techniques nowadays the computed laminography (fig. 4) is used instead of the classical one . Fig 3: Principle of coplanar translational laminography. Fig 4: Stepped movement of source for computed laminography. For each source position one digital image is taken. Computed laminography (fig. 4) can be applied if the radiation source is moved step by step above the object and parallel to the detector. For each source position a digital radiograph is required. The movement of the detector is not required anymore, since it can be done by image processing (image translation). The reconstruction is based on several methods, which are described in . The average method  provides the most stable results. Other methods like filtered backprojection, planar tomography or extreme value method may be also applied . The computed laminography based on the coplanar translational laminography was applied for inspection of steel reinforcement with known direction. 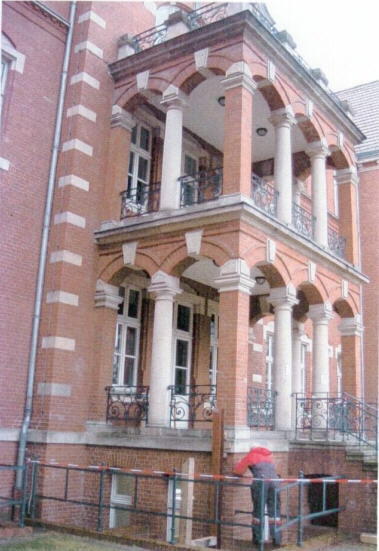 Fig 5: View of a historical building with vaulted masonry in Berlin. 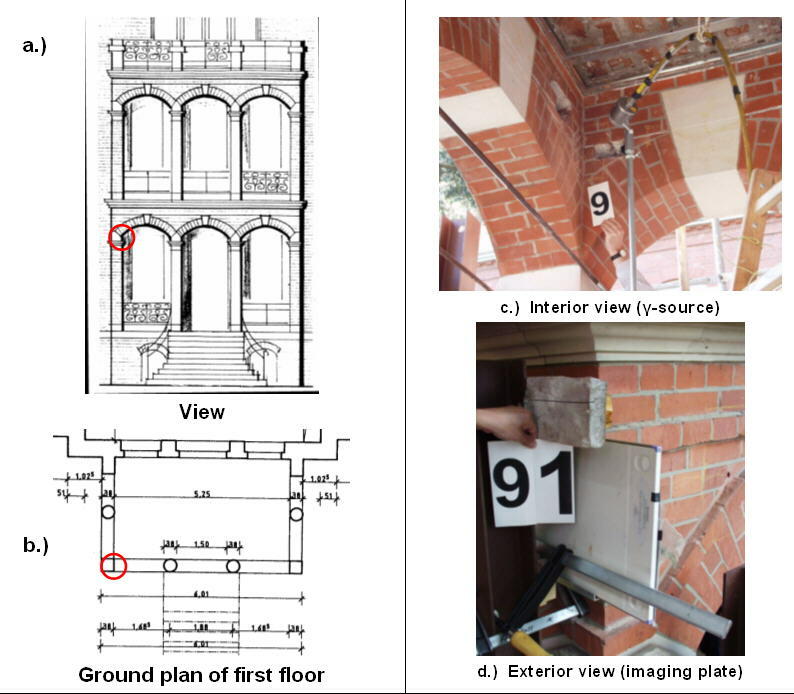 A damage event at an opened building wing, made from vaulted masonry, was inspected (fig. 5). This damage was characterised by growing cracks in the brickwork in the bearing range of the corner pillar. A restriction of the bearing load capacity and the usage property of the corner pillar were the results. As possible cause of damage the absence of a tie member among others, was assumed above the vaulted arch and its inappropriate anchorage in the corner pillar. An immediate clarification of the circumstances was not possible because of missing or incomplete drawings. The aim of the investigations was the localisation of the tie member and the verification of its position, size and anchorage construction in the corner pillar by non-destructive methods. Therefore, the electromagnetic alternating field method, the radar method and classical radiography were applied. The radiographical inspection was carried out with the g-source Co-60 and phosphor imaging plates with an intermediate filter of a lead-tin sandwich in front of the detector. A 0.5 mm steel filter was used in contact with the imaging plate in the cassette. Due to the arrangement of the g-source and detector the set up of the imaging plate was especially important in order to be able to project all details on the detector. The exposure time amounted to 10 to 35 min. depending on the penetrated thickness. As a result it can be stated, that due to the large depth, the tie member could be located only with the radar method and radiographical method. 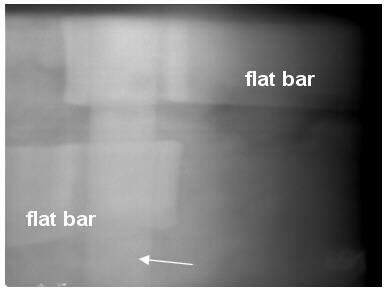 Additionally the radiography allows an exact determination of the cross-sectional dimensions of the tie member and the verification of its anchorage in the corner pillar (fig. 6). Fig. 6e shows a typical arrangement of this anchorage. It could be observed that the flat bars are arranged vertically staggered in the corner area above the vault. For the anchorage the flat bars are bent around a vertically situated round bar. Radiation technique at the measuring point B9. These results were very helpful for assessment of the structure by the structural engineer. 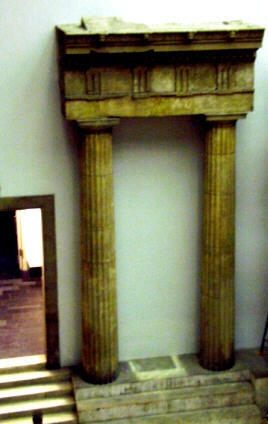 Fig 7: Column yoke of Priene in the Pergamon Museum in Berlin. Fig 8: Position of the radiation source and of all imaging plates at the measuring point M 11 (incl. result images). 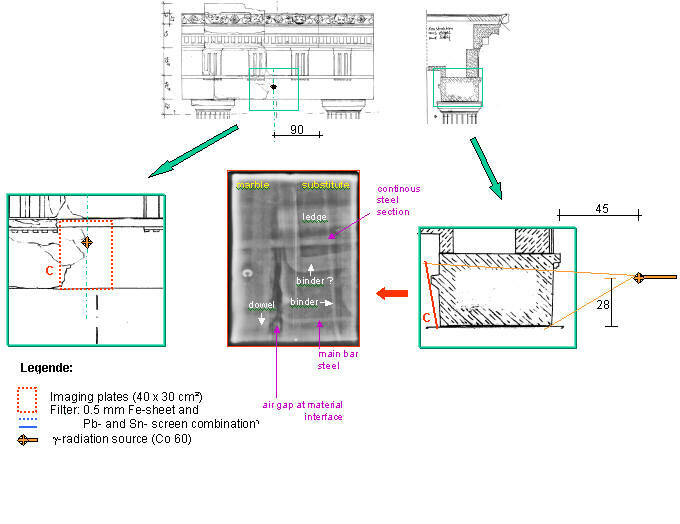 Within the framework of alteration measures in the Pergamon Museum in Berlin building condition analyses were carried out at selected antique contructions. Because of missing existence of documents and drawings extensive non-destructive investigations were necessary, which are described at the example of the column yoke by Priene (fig.7). The aim of the investigations was the non-destructive determination of the kind, position and size of metallic fittings (e.g. steel dowels) in the architrave of the column group. This concerned in particular the material interface of a original marble part and stone substitute material, for example mortar. The investigations were carried out in two phases: preliminary investigations with the radar method and stereoradiography at selected positions. As a result of the preliminary investigations the global arrangement of the metallic fittings could be localised. However, further points remained open, which refer to the size and position of the metallic dowels and to the existence of a continuous steel girder. The stereoradiography was used to solve these problems. Fig. 8 shows a measuring set up for verification of the position of the metallic dowels. A Co-60-source was applied as radiation source using a long guide tube for the radiation source, which was positioned in a bore hole with a diameter of 14 mm above the architrave. This special arrangement was necessary to reduce the penetrated material thickness and the corresponding exposure time per radiograph. 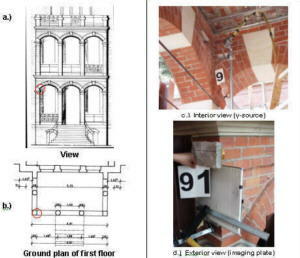 The positioning of the imaging plates below the architrave is described in fig. 8. The enlargement of the cross section is presented in fig. 8a and the detail view in fig. 8b. In the digital images the position of the metallic dowels is clearly recognizable (fig. 9c). They are embedded in mortar in the original marble part and located in the transition area to the stone substitute material. They are bent upwards. This is also recognizable in another radiograph, which was taken at the back side of the architrave (fig. 9). Remarkable is here, that a gap appears in the inner area between the original marble part and the stone substitute material. In this gap we have found the upward bent parts of the metallic dowels. This means, they cannot fulfil its static function. Obviously this static function is performed only by a L-shaped continuous steel section. Fig 9: Position of the radiation source and of all imaging plates at the measuring point M8 (incl. result images). Concrete girders of bridges and buildings are typically reinforced with steel bars. The quantitative measurement of complicated reinforcement structures can be obtained by multi angle radiography or computed laminography . The multi angle radiography requires the inspection from different viewing angles. A bridge girder was inspected with Co-60 and imaging plates as well as with films, which were digitised later (see fig. 10). For reduction of the penetrated wall thickness a hole was drilled above the re-bars. The Co-60 source was positioned at 9 different positions in the hole and 9 corresponding projections were acquired from the same detector location below the girder. The source detector distance amounted to 47 cm and the penetrated concrete thickness was measured angle dependent, between 42 and 56 cm. Fig 10: Arrangement of bridge girder inspection. The reconstruction can be done graphically or computer based. Fig. 11 shows the complicated structure of a graphical back projection, which was performed for a two layer system of steel reinforcement. This inspection was carried out for a gird of the bridge in Havelberg, Germany. The operator needs some intuition to find the right crossing points of the edge projection lines. Fig 11: Graphical reconstruction of two layers of steel reinforcement bars in a bridge girder of the Havelberg bridge in Germany. The reconstruction was performed from 9 double film exposures by measuring the edges of the steel bar projections and graphical connection to the source position.a) Upper steel bars,b) Lower steel bars. The numeric reconstruction using the principle of computed laminography  was developed and carried out at a test block with steel reinforcement. The block was 30cm thick. Co-60 was used as source again and the computed radiography system from Agfa-NDT, ACR2000, was used with two combined imaging plates obtaining a detector length of 80 cm. Fig. 12 shows the result of the inspection. Different steel bars can be visualised in different layers of different depth in the concrete block. This technology shall be applied for the inspection of marble structures of historical constructions as well as for bridge and building structures. Fig 12: Orientation selective reconstruction of steel reinforcement in a 30 cm thick concrete structure with computed laminography. 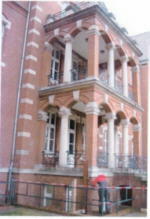 The reconstruction is selective for the vertical structures only. The horizontal structure is unchanged in all slices. a) Reconstructed layer 27 cm above the detector plane. One and a half steel bars are visible. Right and left in the image are artefacts from the limited view angle. b) Reconstruction layer 18 cm above the detector plane. A void is visible. d) Reconstructed surface layer of the concrete wall about 5 mm above the detector plane. Two crosses are visible, which were fixed at the surface as markers. The authors thank the ARGE Pfanner for the cooperation and kindly permission of publication of investigation results at the column yoke of Priene in the Pergamon Museum in Berlin. Furthermore, the authors are grateful to those co-workers of BAM VIII.31 and VII.1, who took part in the inspections. U. Ewert, J. Robbel, C. Bellon, A. Schumm, C. Nockemann: "Digital Laminography"; Materialforschung, 37 (1995), No.6, pp. 218-222. V.Baranov, U.Ewert: " Industrial application of digital tomosynthesis and special types of non-linear backprojection algorithms"; Computer Methods and Inverse Problems in NDT and Diagnostics (CM NDT-95), Minsk, 1995, pp. 82-86.